PUEBLO - To celebrate 2015 as the final year of the 150th anniversary of the Civil War, the University Library at Colorado State University-Pueblo will host the exhibition Civil War 150: Exploring the War and Its Meaning through the Words of Those Who Lived It. This traveling exhibit traces the major events of the Civil War through the letters, personal accounts, and photographs of soldiers, families, and presidents. The free exhibit will be on display in the Library and Academic Resources Center (LARC) lobby from Jan. 12-Feb. 2. In addition to the national traveling exhibit of primary documents and firsthand accounts, the library also will host a series of special events that will examine the impact the Civil War had on the Southwest through some sights, sounds, and smells of the Civil War. A Civil War living history event will take place on campus on from 10 a.m.-4 p.m. on Jan. 14 that will feature participants from New Mexico and Colorado. 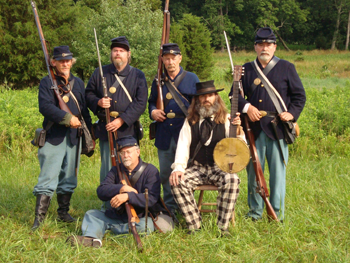 Members of different Civil War units from around the area will portray soldiers representing artillery, cavalry and infantry units, as well as civilians of the period. Camps, weapons displays, musical performances, blacksmithing, and talks by various living historians in period dress all will focus on the Civil War, especially as it unfolded in the Southwest. Presentations will occur both inside and outside the library, depending on the weather. On Jan. 29, the library will feature a special Chautauqua presentation by Dr. Enrique Lamadrid, who will appear in character as Rafael Chacón, a soldier who fought in the American Southwest during the Civil War. Prior to this talk, CSU-Pueblo professor David Volk's music composition class will perform original pieces of Civil War music beginning at 6 p.m. in the Occhiato University Center (OUC) Hearthwell Lounge. Lamadrid's presentation will begin at 7 p.m. in the OUC Ballroom. The Civil War conflict had a tremendous impact on the Southwest, especially in New Mexico and Colorado, where major battles were fought at such places as Valverde and Glorietta in New Mexico against Texan confederates marching to take over the Colorado gold fields. All events, as well as the exhibition, are free and open to the public. Civil War 150 is a national traveling panel exhibition organized by the Gilder Lehrman Institute of American History in partnership with The Library of America. The project, Civil War 150: Exploring the War and Its Meaning through the Words of Those Who Lived It, has been made possible in part through a major grant from the National Endowment for the Humanities: Exploring the human endeavor.